ANALYSIS: Is the Apple TV worth getting now? At Apple’s March Special Event, Tim Cook and Co. announced a bevy of new subscription services, Apple TV+ and Apple Arcade chief among them. And while this isn’t Apple’s first foray into the world of digital subscriptions, these two new services go a long way to making some of Apple's older devices - like the Apple TV 4K - more appealing. Now, in some ways, the Apple TV was already worth getting, especially if you’re already engrossed in the Apple ecosystem and own a 4K HDR TV, but the lack of a dedicated service made it a niche device. That said, Apple TV+ and Apple Arcade feel like they complete the package, making the Apple TV 4K a much more compelling buy when these services go up later this year. But wasn't the Apple TV already worth buying? Admittedly, even before the advent of Apple TV Plus and Apple Arcade, the Apple TV 4K was still a compelling device for the right kind of user - despite not differing greatly from any other streaming box, and being more expensive to boot, no other streaming box had both AirPlay and iTunes. For someone that is already enveloped in Apple’s ecosystem, these features are already tantalizing. Who doesn’t want the ability to pull up a video on their iPad Pro and be able to continue it on their TV downstairs? Plus, if you already have a sizable library on iTunes, it’s convenient to have access to that content on your TV. Watching movies on your iPad is all well and fine, but sometimes, you just have to watch stuff on that giant TV you’re still paying off. And, of course, the Apple TV 4K has HomeKit functionality, which is useful if you’re one of the few people actually using Apple’s smart home technology. Now sure, Apple revealed that AirPlay and iTunes are coming to 2019 Samsung TVs, and said the same for products from Roku, Amazon, LG and others, but that doesn't mean they'll be able to play Apple Arcade games - which, honestly, could be the Apple TV 4K's ace in the hole. When Apple Arcade goes live later this year, the Apple TV 4K is going to come close to being a game console - albeit one with a little less clout and a smaller selection of games. That said, according to Apple an Arcade subscription will get you access to more than 100 games across Mac, iOS and Apple TV. This is a pretty broad range of platforms for games, but the idea is that you’ll be able to put the game down on your iPad, and continue where you left off on your Apple TV 4K. Now, Apple wasn't clear on what titles we'd see outside of a few marquee games like Oceanhorn 2, or even how much it will cost, however, we do know that the developers Apple have tapped for this service are in a league of their own: Developers like Hironobu Sakaguchi of Final Fantasy fame, and Will Wright, the mind behind Sim City, will be on board along with many more talented folks. None of that guarantees that people will adopt these games in the same way we've adopted mobile games like Clash of Clans or Angry Birds, but it does likely point to a higher caliber of ideas and gameplay. Ultimately it’s going to be interesting to see what kind of games will surface, and while there are some lingering questions about Apple Arcade, we can’t wait to get our hands on both it and the Apple TV 4K that brings these titles on the big screen. The Apple TV 4K wouldn’t be much if you couldn’t watch, well, TV on it. 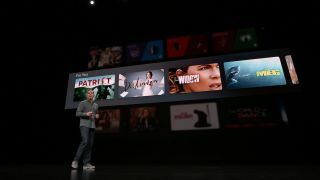 You see, not only is Apple is launching its own video streaming service, packed with all kinds of original programming, but will also upgrade the TV app to include traditional TV channels from your cable provider or content from any other live TV streaming services you subscribe to. It's a big upgrade overall. Speaking of upgrades, Apple brought on the likes of Steven Spielberg, J J Abrams, Jason Momoa and Oprah on stage to talk about the kind of content they’ll be creating. And, with talent like that, pretty much everyone should find something to love. You could rightly argue that this content will be available elsewhere, like the aforementioned Samsung, LG and Vizio smart TVs, but no other place will have the upgraded TV app that organizes all this content in a coherent way. Staying within Apple's ecosystem has its downsides, but the Apple TV 4K's stellar UI and ease-of-use aren't among them. Apple TV 4K: to buy or not to buy? The big question, then, is whether or not these new services make the Apple TV 4K more worthy of your time and money. And, well, it still depends. The Apple TV platform is definitely evolving, but we have a hunch that Apple will launch new Apple TV hardware at either WWDC 2019 or the iPhone 11 launch event. It might be worth waiting until a new Apple TV hits the market – it has been nearly two years since the Apple TV 4K hit the streets. However, we’re not sure how much it could improve, especially if you just want to watch content in 4K. Refreshed innards may make a new Apple TV more competent at gaming but Apple seems pretty content on where things are at right now. But, what we do know is that all of this new content, and these new subscription services, all breathe new life into a device that always seemed like the black sheep of Apple’s lineup... well the other black sheep that's not the HomePod, of course. There’s something to be said about a device that can do it all, and it looks like the Apple TV 4K will fit the bill. Either way, these services will be launching alongside Google Stadia, and maybe even Disney’s streaming service, so we can’t wait to see whether or not the Apple TV finally gets its time in the sun.